WEST System Epoxy cures to a high-strength plastic solid at room temperatures, by mixing specific proportions of liquid epoxy resin and hardener. This clear, pale yellow, low-viscosity liquid epoxy resin is formulated for use with WEST SYSTEM hardeners. It can be cured in a wide temperature range to form a high-strength solid with excellent moisture resistance. Designed specifically to wet out and bond with wood fiber, fiberglass, reinforcing fabrics and a variety of metals, 105 is an excellent adhesive that will bridge gaps and fill voids when modified with WEST SYSTEM fillers. It can be sanded and shaped when cured. In roller applications, it has excellent thin-film characteristics to flow out and self-level without fisheyeing. 105 resin has a relatively high flash point and no strong solvent odor, making it safer to work with than polyesters. By using a simple "cookbook" approach you can tailor the handling characteristics and the physical properties of the cured epoxy to suit your working conditions and specific coating or bonding application. 1. 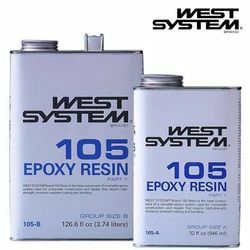 Start with 105 Resin, the basic ingredient of all WEST SYSTEM epoxy compounds. 2. Mix with one of four WEST SYSTEM Hardeners. Select a hardener for its intended use and for the cure speed best suited for your job in the temperature range in which you are working. 3. Add one of six WEST SYSTEM fillers to thicken the mixture as needed. Select a filler for its handling characteristics or cured physical properties. Or, add one of six WEST SYSTEM additives to provide specific coating properties. I've worked with West many times and have often had it exotherm on me with only two pumps of material in a cup. How can on possibly mix up enough to put a barrier coat on a boat in warm weather? Use the slow hardener and mix a small quantity in a large container like 10 oz in a 2 gallon container and pour it out to a full size roller tray. You can also cool down the resin and hardener in a refrigerator before mixing. Please call one of our tech associates at (800) 497-0010. Each epoxy will have different working and cured properties, and we would like to help you select the best one for your application. No. You must purchase the hardener separately. There are three to choosetemperature. Hi Dan, you need to purchase the hardener and the resin, we do sell kits that include both components as well. The hardener is sold separately. There are different hardeners fordifferent purposes. Sorry this is beyond my area of expertise. I only work on furniture. I did something similar on my dingy, but I actually replaced the foam in between fiberglass with a plywood. I don't see why it would hurt you, if you put a plywood patch in place. Besides that, you may find that the size of the patch can be bigger than you think it is, when you open the top glass layer. It's right of you to question your surveyor. Epoxy its self is really not designed for filling gaps to this degree for a number of reasons. When you remove the old core, it will be saturated or completely rotten. in that area. Scoop out any core material that you can from your hole that you opened up. Marine ply or one of the commonly used foam core materials, even G10 is unnecessarily strong but fits the application. Thicken the epoxy with silica and fill the carved out area with the new core material, and then you can re-glass the hole and fix it cosmetically. Epoxy is very hard and brittle on its own, as well as heavy (if that's a factor for your application) and an expensive way to fill an area. Though your boat is 30 years old, it was also engineered around having a core material to support the internal compressive strength and enough sheer strength, at the same time as some flexibility. Hi Steven, you can clean tools up with white vinegar or acetone. When used with the 205 Fast Hardener, the lowest temperature that they recommend is 40 deg F.
West Systems 105 what does it come with when I order i.e. does it come with the epoxy , hardener and pump set. When you buy West 105 it only comes with West 105. No pumps or hardener. We do sell West System Epoxy Kits as well that do include the hardener and pumps. My project is to coat the iron keel on an '86 boat. POR15 seems to get good ratings online for stopping rust. My thought is to overcoat the POR15 with West System, but will it stick to POR15 ? PS I barrier coated a badly blistered bottom with lead keel using West back in the 80's. It still looks great today! I'm not familiar with POR15. I would recommend testing a small area with that and West System to see if there are any problems. will using 105 epoxy and 206 hardener create a clear or amber fiberglass lamination for bow limbs? The 206 hardener is a little amber, if you want it to be clear use the 207 Clear Hardener. I would like to build a bow for my grandson, and making my own fiberglass laminations. Would your 105 epoxy resin be a good choice. Will be building a bow oven so heat curing will not be a problem should that be necessary. Since a bow needs to flex, a better choice would be West System GFlex or Totalboat FlexEpox. Dog has chewed on wooden table claw feet postal legs. Will this product work ? It will work to glue it together. Have always used this product and don't like to take chances . . . I know how to use it and it always works but must to care re. ambient temps. That said, have had a some Totalboat epoxy and hardeners that will likely try them out on a few smaller projects over in the next few months. Performance deserves 5 stars. Storage can be a problem. For a occassional user who tries to store resin for say 12 months .. it gets cloudy, makes you wonder. Thank you for the prompt delivery. The product specifications are exactly as mentioned in the description. Thanks!!! Really glad to have bought this product. It was what I needed. Thank you for the prompt service and delivery. Used on a kayak I am building from cedar strips. Coupled with 4oz fiberglass on exterior and 6oz fiberglass on interior provides a very solid hull. I am completely satisfied using this product. Thank you for the timely delivery. I am satisfied and happy to have bought this product. I've used several different manufactures of epoxies. West System has always been the most difficult to handle and to achieve the results I'm looking for. Always bubbles, leaves to much blush, and never seems to cure correctly. Best I've found and with best results was ProBuild by Adtech. Always comes out right and is never frustrating to use. I've been using this product for 20 years ! So many projects over the past 20 years and never a disapointment.